This is the third novel in Wilson's Falcón quartet, following "The Blind Man of Seville" and "The Silent and The Damned". 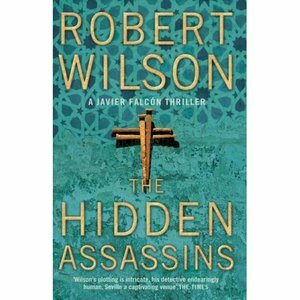 In "The Hidden Assassins" Wilson is really pushing some boundaries with a plot based around the bombing of an apartment block in Seville; a block known to have a mosque in its basement. Thus we have a story that explores the cultural tensions that we have in the world - tensions we have seen increase over the last few weeks in the UK particularly, following another security alert. If fiction can help to improve our understanding, then this novel does it. Written from the points of view of the many who are party to the tension, "The Hidden Assassins" provides an informative insight into the world today, whilst entertaining through great writing and excellent plotting. Whilst the novel is long at some 450 pages, Wilson's writing is lean and every word counts. What, at first glance, may be interpreted as a "throw away" comment is there for a purpose. Take one sentence in the description of Falcón's ex-wife Inés, for example: "Her stick-thin forearms seemed to have grown more hair and they made her feel curiously weak." The reference to hair growth says so much about how Inés feels about herself, her physical and mental state. Wilson's writing is also very subtle and understated. This is put to full effect in the description of the explosion itself, as seen through the eyes of the mother in one ordinary hard working family to whom we have just been introduced in the narrative. Every moment of sheer horror is described, every physical aspect as seen, in what can only account for a second or so, in total. There is no emotion in the narrative - it is the reporting of fact. The emotion is all in the reader. Told with constant reference to timescales, there is no respite in the reading of this investigation - it's a page turner to the bitter end. By far, this is the best novel I have read this year and it is also so very topical, a "must read" in today's climate. (So good in fact that I've nominated it for Susan Hill's "The Book Bloggers' Book Prize". Considered by one newspaper reviewer of punctuating his main plot with "disconnected soapy storylines", I beg to differ. The only sub-plot I considered to be verging on the superfluous was that of Falcón and his love interest. He wants to re-establish his relationship with Consuelo, but we learn, through the odd chapter of her own crisis and why she chooses to remain distant from him. That, in itself is original, albeit not pertinent to the plot in hand. Had they managed to get together early in the novel, I doubt that anyone would bat an eyelid. However, it does set up one scene for the fourth and final novel in this quartet. HarperCollins has a splendid interview with Robert Wilson about the background to this novel, which can be read here. Wilson is currently on tour in Australia, which has led to another interesting interview in The Australian, which can be read here. If new to this series, "The Hidden Assassins" can easily be read as a stand alone, but I'd recommend reading the series, starting with the first novel "The Blind Man of Seville". Someone please enlighten me if Calderon really commited the murder or is is his mistress? Thanks for your comment Fred. Those I know who have picked up a Wilson have not looked back, apart from seeking out his backlist that is. Many others, I suspect, would also enjoy his novels, once they get to know about them. I'll let you off on the "spycy" neologism! It was a good piece of creative application, I thought! A great brand new novel with Javier Falcon, with this time a "spycy" level (sorry for the neologism). What I really love in Robert Wislon books, is all those misleads that Javier Falcon is exploring, as if their shadow were only there to hide the truth from us. As sevillan says: "el mejor del sol es la sombra" that means The best under the sun is shadow. Well, that's for sur when it's under a Robert Wilson's book! Your choice, David, but honestly, it's a remarkable read and so good! My wife said there was too much preaching, so I'll give it a miss. Rose - I appreciate and understand your comments as full well you know, I think. It was a long time ago we exchanged comments on "The Blind Man of Seville", but I still remember them. Maxine - Falcon appeals to many women but not all; just as Wilson's prose is so very readable to some, but not all. I think Falcon is the key here. If you were taken in and enamoured by the character that was/is Falcon, the one novel becomes a series to grab at the earliest opportunity. I was, Rose was - we can't get enough of the man! Funny, I am a crime fic reader addict, but having read the first in this series I have no urge to read more. I quite liked "Seville" (especially the WW2 bits) but somehow I found it took too much effort for what it provided in way of reward. Just finished this book myself, and like the debut in this series, it's far and away my best read of the year. As for the soapy storylines - pshaw!! Wilson is a master when it comes to steamy sexual undercurrents, and this was a rather welcome return to earlier storylines for my money. Sounds excellent CFR. I really want to read that now...as soon as I've worked my way down half of my pile perhaps.